On the first day of FC Barcelona's trip to Thailand, internationally acclaimed players Lionel Messi and Jose Manuel Pinto spent the morning sharing football skills with children who have intellectual disabilities. The players and participants represented a unified group of young people with and without disabilities participating in sport and promoting team-work and partnership. FC Barcelona and UNICEF have had a global partnership since 2006 to improve the lives of millions of children by providing them with the opportunity to receive an education, participate in sports and learn positive values such as inclusion. Reflecting the team’s commitment to the partnership, FC Barcelona’s Messi and Pinto answered questions from the 20 children and young people and taught them football skills. Some of the children and young people play on Thailand’s Special Olympics National Unified Football team, which has qualified for the 2014 Global Unified Cup in Brazil – organized by the Special Olympics and FIFA. The Unified Team is made up of young people with and without intellectual disabilities who train, practice and play together on a regular basis, exemplifying how children with disabilities can meaningfully participate in sports together with other children. In Thailand, there are an estimated 1 million people with intellectual disabilities, some 600,000 of them children. Studies have shown that providing children with intellectual disabilities opportunities to participate in physical activities and sports can help promote improved physical and mental development as well as communication and social skills. UNICEF Thailand is working with Special Olympics Thailand, a non-government organization, to promote social inclusion for these children through sports training and competitions. Speaking at the event, Dr. Isiye Ndombi, UNICEF Deputy Regional Director for East Asia and Pacific, commended FC Barcelona for shining the spotlight on the important issue of providing equal opportunities to compete in sports for children with disabilities. FC Barcelona is committed to supporting the rights of marginalized children. 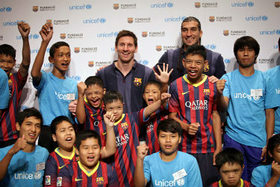 Since 2006, FC Barcelona has provided €1.5 million annually to support the work of UNICEF. In 2011, FC Barcelona and UNICEF renewed their partnership for a further three years, focusing on Sport for Development within the wider context of ensuring the right of all children to an education. Through the partnership, UNICEF and the FCB Foundation are committed to providing millions of children with the opportunity to receive an education and learn positive values through an integrated programme of physical education, sports and play in Child Friendly Schools in Brazil, China, Ghana and South Africa. The football club also features the UNICEF logo on its premier football jersey as a sign of its continued commitment to campaigning for the rights of all children.